Located just above the North Cascades Highway 20, just a couple kilometers beyond the famous Liberty Bell group, this amazing wall has been hiding in plain sight for decades. The M&M Wall is one of the biggest and cleanest roadside “crags“ in Washington State. 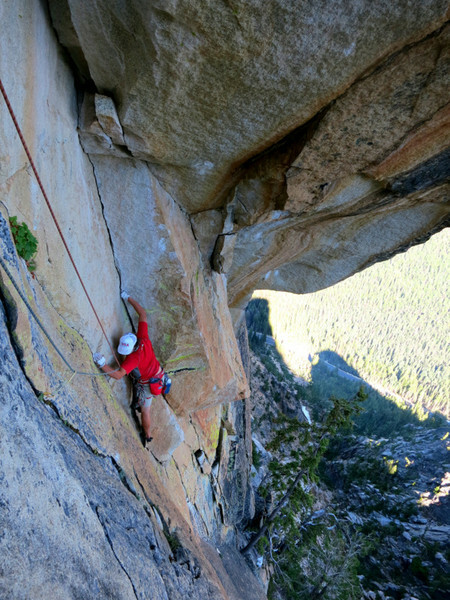 Like the Liberty Bell group, the climbing is alpine in the sense of elevation and ambiance, but pure rock climbing in the sense of approach distance and complexity. 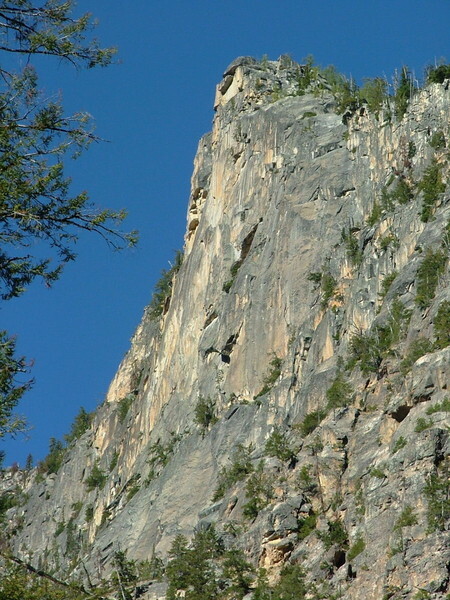 The first half of the wall is less than vertical, featuring thin corners connected by technical slabs, the upper half of the cliff rears to plumb vertical and the climbing becomes both burly and technical. The signature feature of the cliff are the deep caves that cross the wall at mid height, the largest `supercave`is the size of a tennis court, the two smaller caves have yet to be visited by human. A dominant theme on this wall is exceptionally clean, bulletproof granite. Some of the nicest stone to be found north of California. To paraphrase one of the walls biggest proponents- Blake Herrington: `your shoe rubber squeaks when you pressure an edge`. Adding to the exceptional rock quality, unique, incut pockets dot the wall, often miraculously making appearances in the middle of crux sequences. The southerly aspect of the wall makes it a great early and late season objective. Pitch 2 of The Tiger, 5.10d. The golden granite remains consistently high quality throughout the height of the wall. In 1969 Tom Langdon and Mead Hargis made the first ascent of the formation. Climbing the the wall in a day with 11 pitches at 5.8 A4. A very impressive one day ascent, Langdon and Hargis were certainly at the top of their game. Besides a few low mystery anchors of varying vintage. No other known ascents of the wall occurred in the next 40 years, despite the fact that the Langdon-Hargis route is listed in Beckey’s Cascade Alpine Guide. Pitch 3 of the Ellen Pea route. 5.11a. Spectacular and bizarre the pitch is less intimidating than it appears. 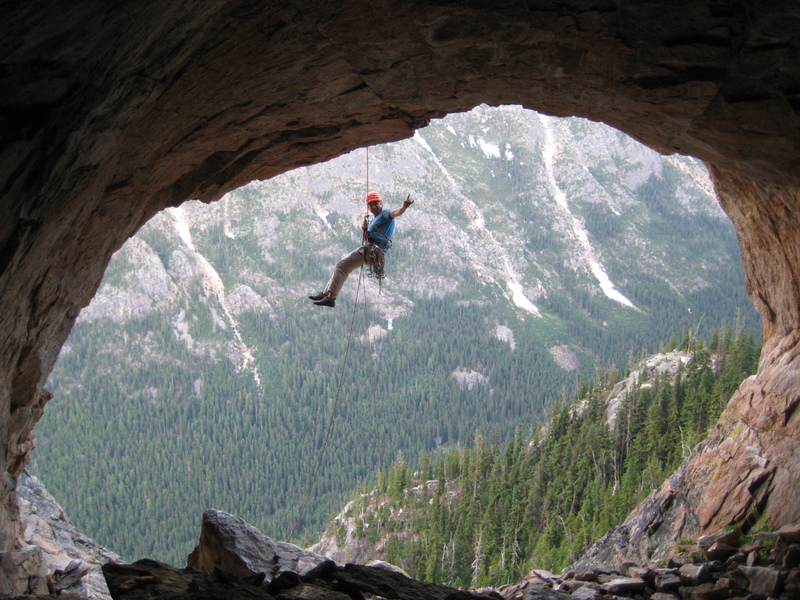 Over the next few years The Ellen Pea route – more commonly referred to as the Supercave became a cult classic among a small group of Washington adventure climbers. In 2014 Blake Herrington worked out and redpointed a stunning two pitch variation off the mid way ledge. Part of the original L&H route, this awesome 5.12 thin crack is reported to be one of the best in the State. Around the same time Shaun Johnson and Mike Pond attempted a new line on the center portion of the wall, using the high access ledge to bypass the initial apron the duo climbed 4 pitches using a mixture of aid and free climbing. Finally over the course of two weekend trips Blake Herrington, Colin Moorhead, and Max Tepfer established an incredible, independent line up the center of the wall. The 11 pitch, 5.12-, The Tiger rivals The Thin Red Line in quality and difficulty and is certainly one of the best multi pitch free climbs in the North Cacades. Park at milepost 166, just west of the pullout for the Burgundy col approach. Hike directly up the gulley to the base of the wall. The gully holds snow early in the season and mountain boots and crampons will be an asset, by mid summer the gulley is predominantly scree, one steep step can be passed on the left. There is water in the gulley into late summer. After approximately 45 minutes exit the gully onto a right trending ledge and the start of the routes. 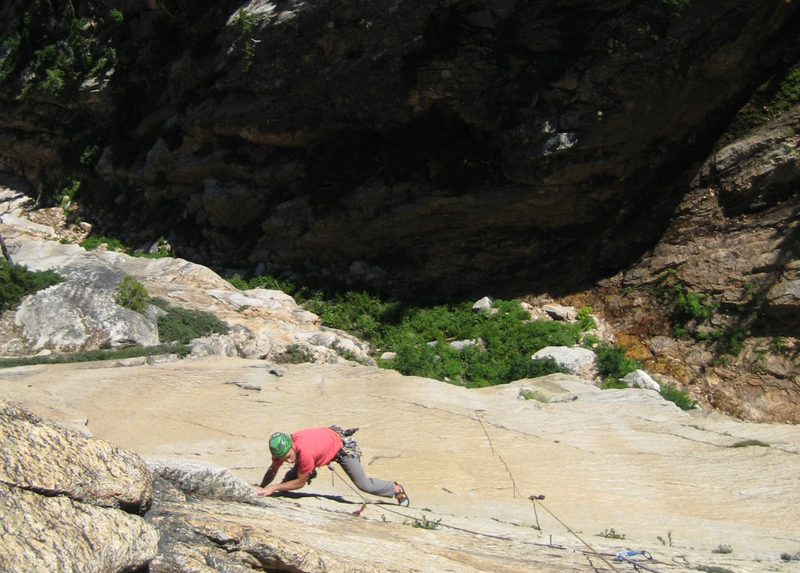 The first modern route on the wall, consistently good climbing on excellent rock. 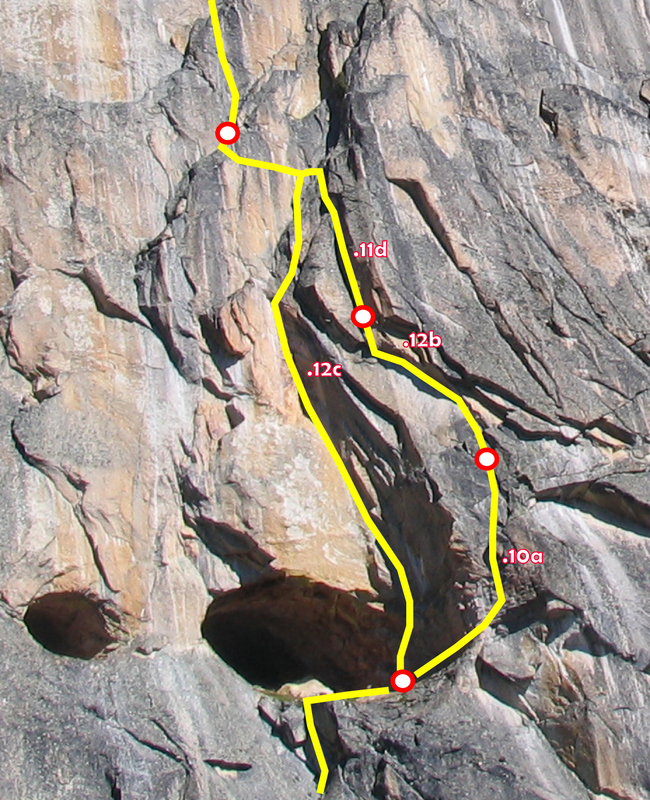 This route climbs the right side of the wall accessing the bizarre supercave feature. Access via ledge system that slants up and right out of the approach gully, start off the upper right side of the ledge. Originally climbed in 8 pitches. 1. 5.10a. 40m. Climb left facing corner to belay stance just below left slanting twin cracks. Lower pitches of the wall. Click and enlarge for detail. 2. 5.10d. 50m. Diagnalling twin cracks lead to an immaculate, inset diherdral with a challenging thin crux towards the end. Walk left approximately 20m to the start of the next pitch. 3. 5.11a. 50m. Climb corners and flakes straight up to the large left slanting ceiling/arch feature. Navigate left and up until it is possible to layback/undercling/stem/chimney the severely leaning corner crack of the arch. Crux exits arch over tricky lip sequence. A long,complex pitch. 4. 5.11c. 20m. Undercling a short, left leaning arch until you can pull out right on face holds. Make a difficult step up move past a second bolt and on to the Supercave. Intermission. Untie, run around, hacky sack, etc in the giant Supercave. 5. 5.11b. 30m. Exit the left side of the cave via a short overhanging wall aiming for the left facing corner an early crux eases to fun laybacking to a pedestel belay ledge. 6. 5.10a. 56m. Steep corners and ramps up dominant weakness to the top of the wall. Rack: Double cams from tips to #2 BD, wires, extra extendable draws. This amazing thin crack testpeice is actually a free version of pitches 4-5 of the original L & H route. Accessed and climbed as a variation to the Ellen Pea, alternatively access by traversing in on the higher ledge out of the approach gulley. 1. 5.12b. 25m. Climb flake until possible to span right into finger splitter and up a shallow left facing corner. Continue via face climbing to the belay stance. 2. 510d. 30m. Climb the thin crack past a bulge, angle up and left into the supercave. “it would have been even nicer to have climbed the beautiful striped flake, hanging so aesthetically SUPPLE AND POUTING at the upper left of the wall” – Lee Arden Pete, after the first ascent of the Ellen Pea Route. Pitch 3 of The Tiger. 5.11c. The proud center line of the wall. The Tiger links beautiful, technical corners through the center off the cliff to another deep cave feature. Above the cave, the wall becomes vertical and the climbing more strenuous, finishing up the prominent tiger stripe flake high on the wall. 1. 5.8. 20m. Climb up and right past flakes and pruned tree to gain a clean, left facing corner to belay stance. 2. 5.10d. 45m. Climb up and exit corner over a short, akward roof. Zig zag up beatiful golden slab, linking thin crack features. Engaging climbing despite the addition of two retro bolts. 3. 5.11c. 50m. 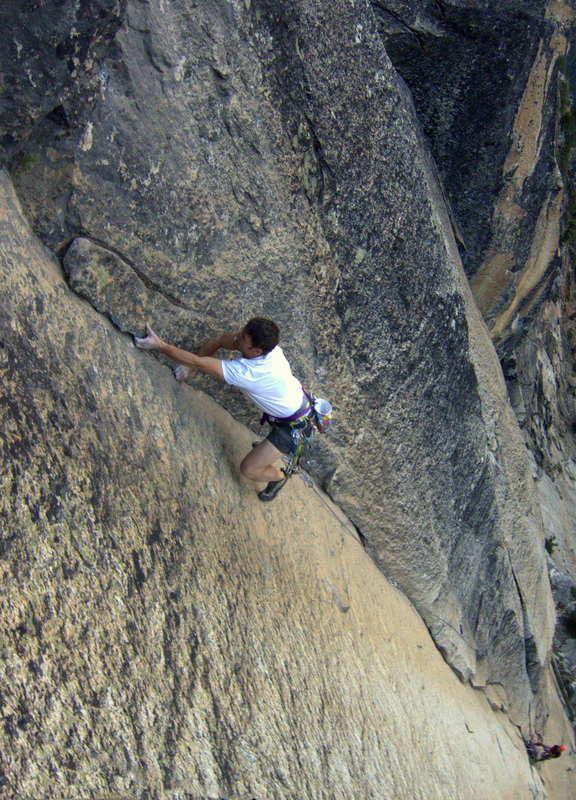 Climb flakes and face climbing past a bolt to gain shallow dihedral, at the top of the dihedral move right past bolt into upper corner feature. Sustained and technical. Walk left along ledge for approximately 10m, to the start of pitch 4. Final hand traverse on pitch 9. 5.11d. 4. 5.10c. 30m. Up slabby corner to a bolt, climb up and right past flexy flakes. 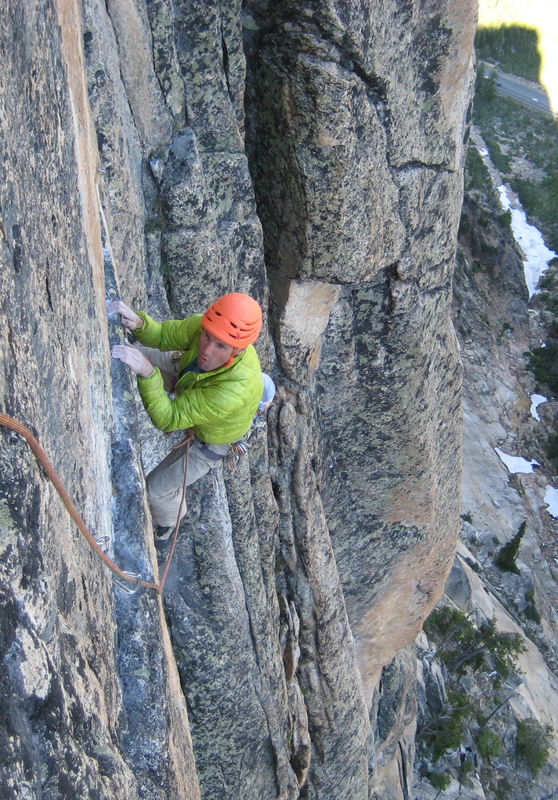 Laybacking up a solid flake feature leads to the belay. 5. 5.11a. 35m. Classic, thin fingers corner leads to the cave (Tiger Belly`s Lair). 6. 5.10a. 15m. Exit right the side of the cave past a bolt, climb steep, juggy wall to a stance below leaning roof feature. 7. 5.12b. 15m. Climb leftwards along the exposed, stepped roof, alternating between strenuous underclinging and overhead jug hauling. Wild climbing with lots of air! 8. 5.11d. 25m. Power layback past two bolts, easier ground leads to an exciting hand traverse left past two more bolts finishing on a sloping belay ledge. 9. 5.11b. 35m. Follow cracks and flakes straight up until it it possible to make a balancey leftwards traverse along diagnalling thin crack. Continue up an easy ramp to the belay at the base of The Tiger Flake. 10. 5.10b. 35m. The Tiger Flake, . The walls most obvious feature, make a short lunge off the anchor to gain a ramp leading to the flake. Burly laybacking on perfect rock, protected by big cams. 11. 5.10a. 40m. 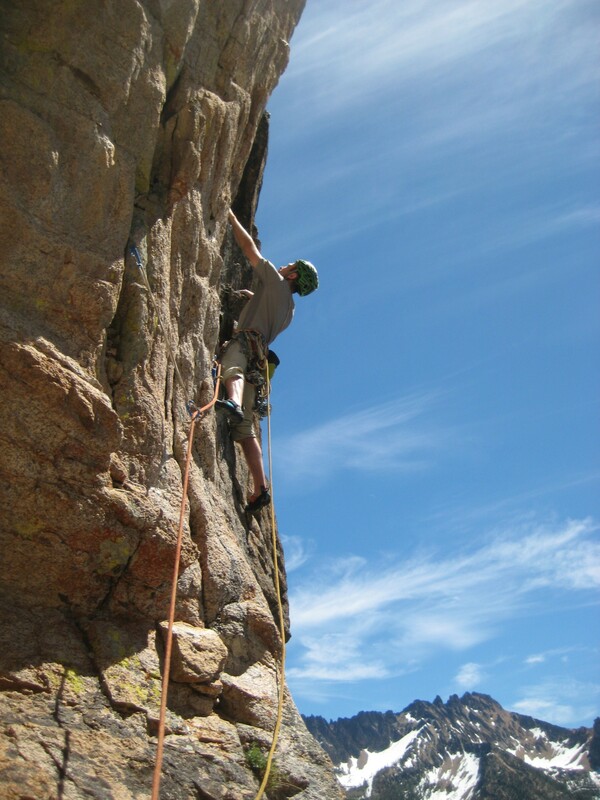 Follow weaknesses up and right with a final crux around a bulge before gaining the ridge. This is the only mediocre pitch on the route, there are several possibilities for a higher quality finish. Upper Pitches of The Tiger and Ellen Pea. Note 3rd class ledge makes it possible to bypass lower pitches and rappels. Click and enlarge enlarge for detail. This is a variation to The Tiger. `”Eye” climbs the impressive orange corner directly out of the cave, bypassing pitches 6-8 of The Tiger in one, spectacular 40m direct. Climb directly out of the right side of the cave passing 3 bolts, technical laybacking and stemming lead up the well protected corner, a powerful bouldery dyno past a bolt is capped by pumpy jug hauling (save a couple small cams). The hardest and possibly best pitch on the wall. Close up. Eye of the Tiger is on the left. Pitches 6-8 of The Tiger on the right. Exiting the cave on pitch 6 of The Tiger. 5.10. The Wine Spires are in the background. Both Ellen Pea and The Tiger require two ropes to rappel. Almost every anchor is bolted. 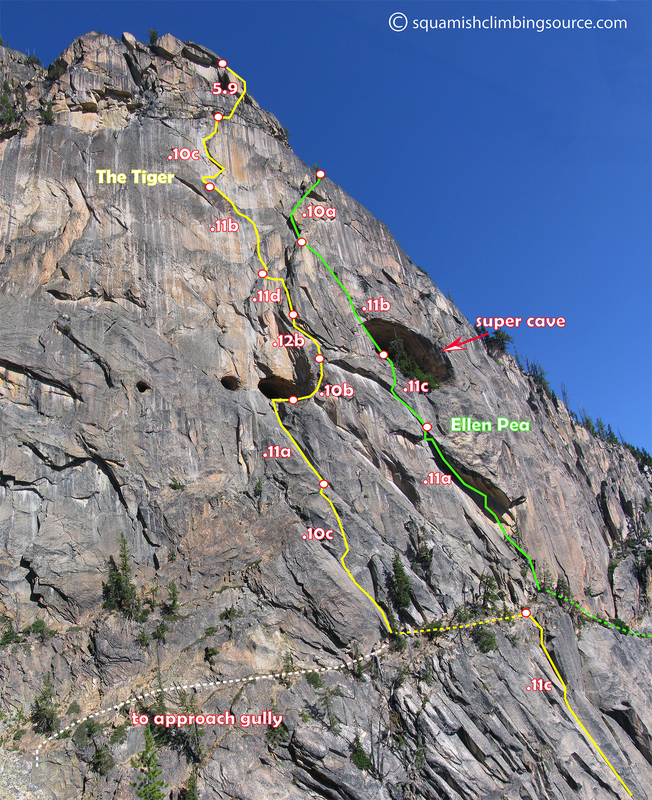 Both routes, but particularly The Tiger, require some diagonal rappel shenanigans to avoid being stranded in no mans`s land. Alternatively top out the formation and descend strightforward 3rd class ramp (climbers left of the wall) to regain approach gulley.